108 pages | 31 Color Illus. | 11 B/W Illus. Lipidomics forms part of the field of metabolomics, which in turn follows on from genomics, transcriptomics, and proteomics, in a top-down manner. It is the study of hydrophobic molecules called lipids; however, lipid molecular species are so numerous that investigators tend to subdivide global lipidomics into targeted lipidomic approaches. 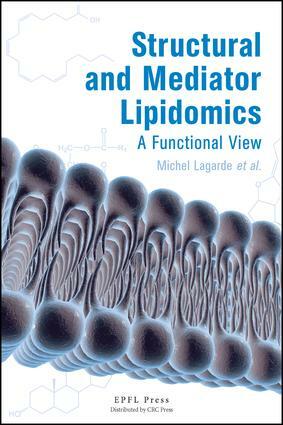 This book focuses on structural and mediator lipidomics, with a particular emphasis on their functional aspects. This includes lipids deserving of special interest for their structures (especially as parts of cell membranes or plasma lipoprotein particles) and lipids known for their biological activities, which mediate the action of cell agonists (for example, hormones, growth factors, etc.). The oxygenated metabolites of the major functional w6 and w3 polyunsaturated fatty acids in mammals, in particular arachidonic and docosahexaenoic acids, are presented, with special attention paid to their structure-function relationships. These metabolites are very active, and their biological relevance was recognized early on with a Nobel Prize in Physiology and Medicine in 1982. Finally, general principles for the high performance analysis and characterization of lipid species are also presented. The book has been written for undergraduate students and scientists interested in the field of lipids. Clinicians will also be able to find useful information, due to the numerous references to pathophysiology.